The park provides spectacular views of beautiful red rock formations and is a Registered National Natural Landmark. 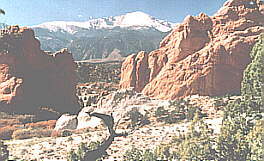 The Garden of the Gods Park is a "must-see" attraction that offers adventure, intrigue, fun, and learning. The park is a most impressive natural wonder. There is a Visitor Center where you can learn about the massive red sandstone formations, buy souvenirs, enjoy a meal or simply revel in the spectacular views. The Center is really a museum of natural history. Visitors of all ages will enjoy the dynamic 12-minute multimedia show with four screens and lasers on "How Did Those Red Rocks Get There?" The Garden of the Gods Trading Post was built by Indian trader and local artist Charles E. Strausen in the late 1920s and was designed to resemble the homes of the Pueblo Indians. The Trading Post has become the largest gift shop in the Pikes Peak Region. Featured are authentic Native American arts, crafts, and jewelry.